"Wise enough, a man ought to be, not too crafty or forward. The best of lives is led by those who know where to draw the line"
Life came about through burning ice, biting flame. In the south is the kingdom of Muspell, a land that flickers with dancing-flames - seething, glowing white hot. None can stand it but those born to it. Dark Surt sits on the farthest reaches of this kingdom, a flaming sword brandished in his right fist, waiting for the end when he will rise and give the gods a mauling and whelm the world in fire. To the north is Niflheim, packed with ice, covered with great, snowy wastes. 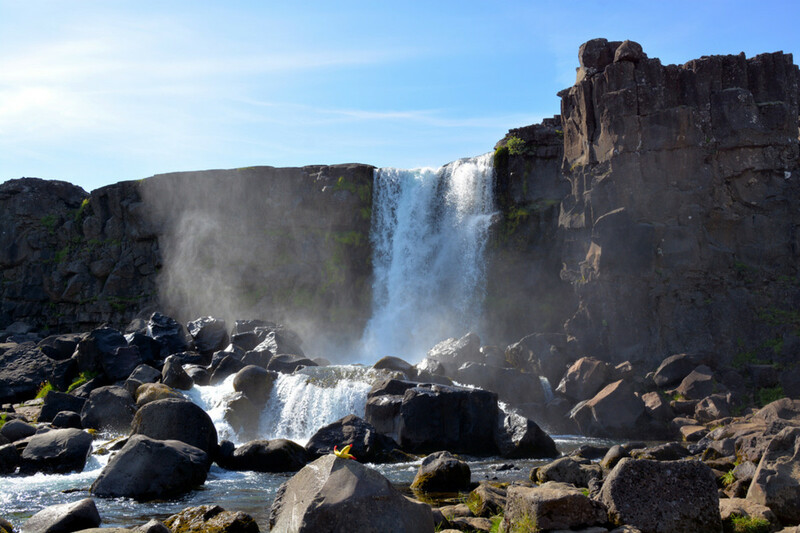 At the heart of this land burbles the spring Hvergelmir, mother to eleven rivers known as the Elivagar. Between these kingdoms once stretched a broad emptiness, a chasm known as Ginnungagap. The rivers from Hvergelmir emptied into this nothingness, the yeasty poison in them thickened and crusted like slag and the waters turned to ice. The poison also spat out a drizzle - an unending, bleak hagger that settled at the bottom and hardened. Thus it went on until the northern part of Ginnungagap lay laden with ice and hoar-frost, a frightening waste-land beset by bone-chilling gusts and wind skuthers. 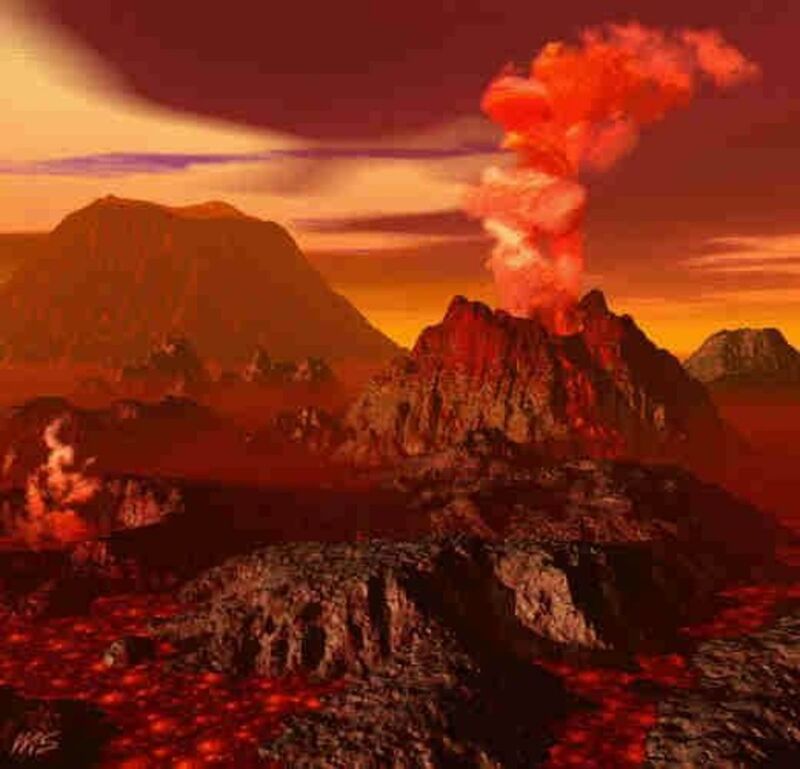 However, just as the northern half was frozen, the southern half ran with molten rock, glowing. Between the two was a milder land, summery, with the warm breath drifting northward from Muspell where it met the cold rime from Niflheim, land of mists and iron-cold. The one touched and played over the other, ice melting, thawing and dripping. Life stirred in the in the drops and formed into the giant Ymir, a frost giant, evil from the onset. As he slept he sweated. A man and a woman grew from the ooze below his left armpit, one of his legs fathered a son on the other. 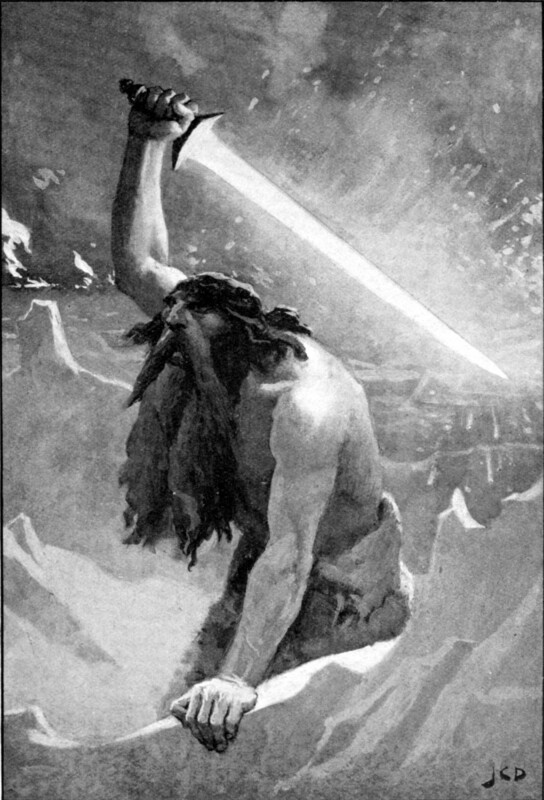 Ymir was forefather to the Frost Giants, named Aurgelmir by them. As more of the ice melted in Ginnungagap, the mess that grew from it turned into a cow, Audumla. 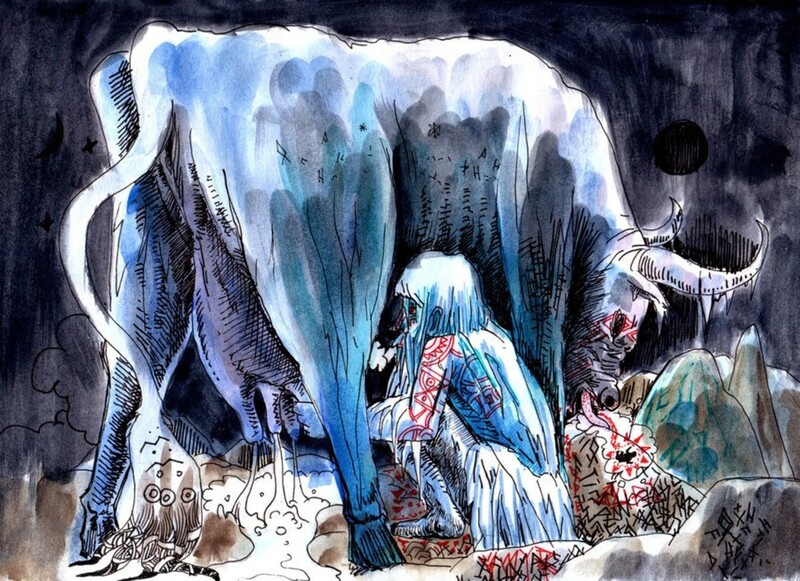 Ymir fed from the four rivers of milk her teats yielded, and Audumla fed off the lichen that grew on the ice. She licked the salty blocks and by evening on the first day a man's hair sprang from the ice. She licked more and by evening on the second day the head was out. By the end of the third day a man stood tall, handsome and strong. His name was Buri. 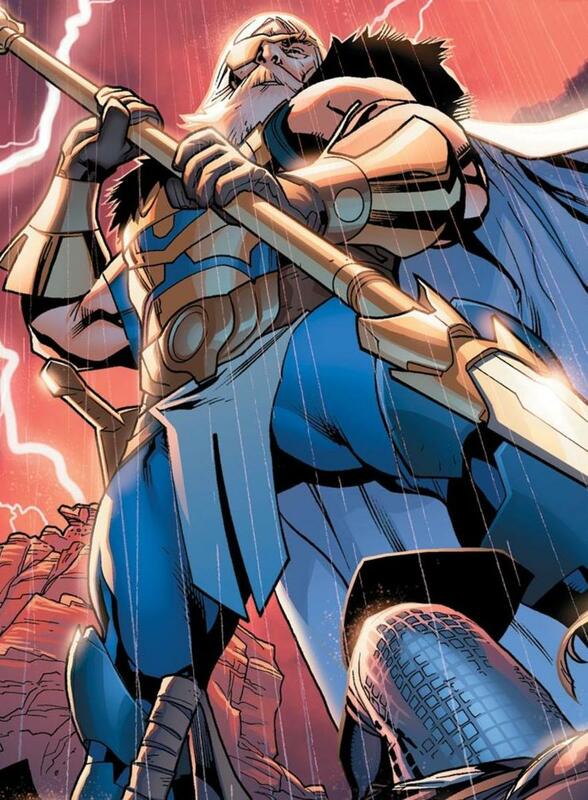 In good time he had a son, Bor, who wedded a daughter of Bolthor, one of the Frost Giants. She was Bestla, mother of Bor's three sons Odin, Vili and Ve. This was all in the early times, before the waves of sand, the sea's cool ripples on the strand, the waving, sweet green grass. There was no earth, no heaven above. There was only Muspell and Niflheim, with Ginnungagap between them. Bor's three sons had no liking for Ymir and the growing gang of wild, brutish Frost Giants, and with the passing of time the brothers grew to hate them. One day Odin, Vili and Ve attacked Ymir, killing him. Ymir's wounds, like deep red springs, flowed so fast they drowned all the Frost Giants but for Bergelmir and his woman. They set out in their hollowed-out tree trunk canoe and rode the wave of their father's gore. 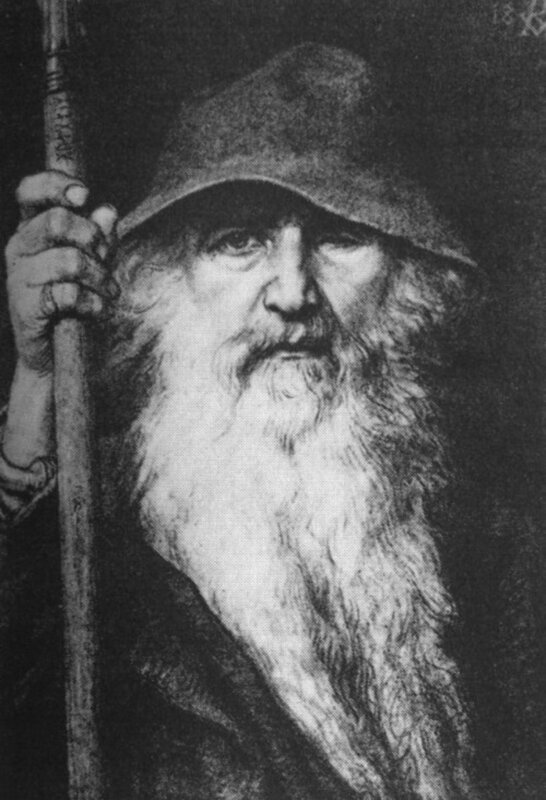 Odin and his brothers heaved the dead giant onto their shoulders and bore him to the middle of Ginnungagap, where they made the earth from his corpse. The land was shaped from Ymir's flesh, the mountains from his unbroken bones. Of his teeth and jaws were made the rocks, boulders and stones. 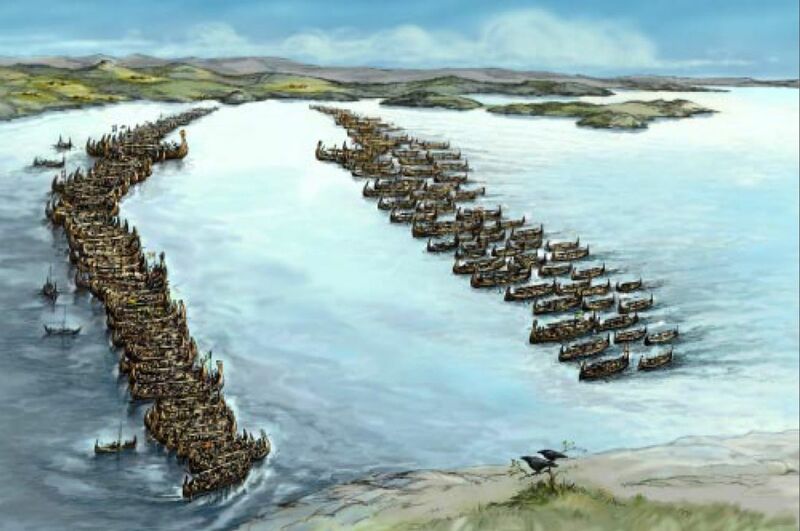 The brothers used the great part of his blood to make the land-locked lakes and the sea. Once the land was shaped they set the heaving ocean around it in a ring, and as it is so wide men put aside any thoughts of crossing it [not for long, as we know. 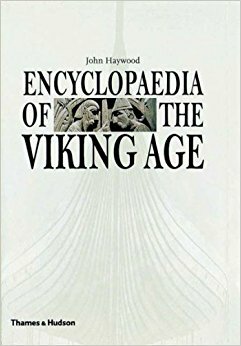 Viking seafarers reached the Atlantic islands and the New World by the end of the 10th Century]. The three brothers raised Ymir's skull and from it made the heavens; they set the skull so that its four corners reached to the ends of the land. Dwarves were sat at each corner, their names Aust and Vest, Nord and Syd (east and west, north and south). They seized on the sparks and glowing embers from Muspell and named them Soen, Maand (sun and moon), and Stjerne (stars). These were set high over Ginnungagap to light the heavens and earth by night. Each star had its place, some being fixed and others free to roam the heavens. The earth was round, and lay within the deep ocean's ring. On the strand the sons of Bor marked out the land and shared it amongst the Frost Giants and the Rock Giants. At Jotunheim the giants set down roots. So unruly were they that the brothers built a garth inland, ringing a great swathe of land shaped from Ymir's brow. The land within was named Midgard. The sun warmed the stones, the land was green. Bor's sons put Ymir's brains to good use, flinging them high into the sky where they became clouds. 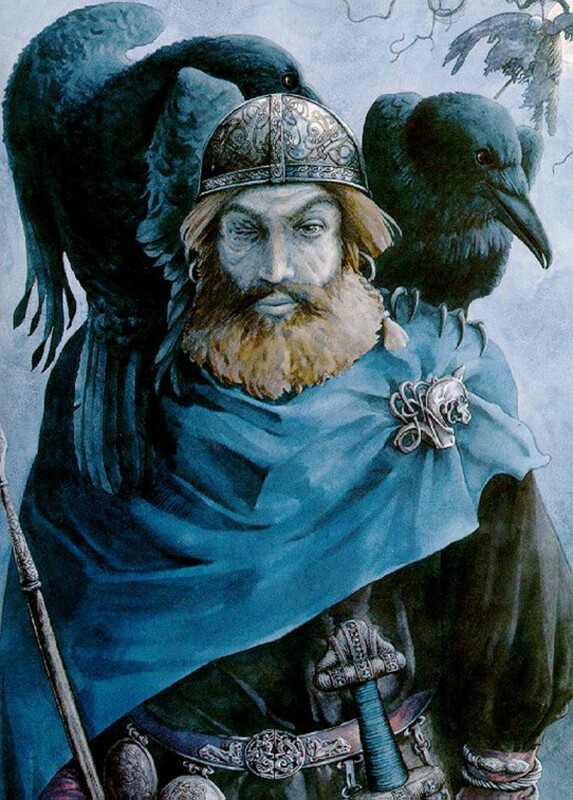 Odin, Vili and Ve strode out along the run of the land one day, where the land met the ocean, chanced on a pair of fallen trees with roots ripped from the earth, one an ash, the other an elm. The sons of Bor up-ended them and made the first man and woman from them. 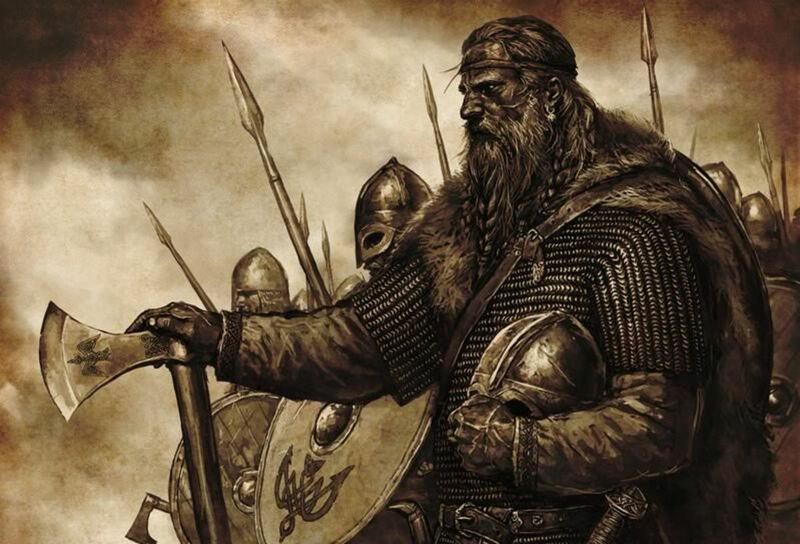 With his breath Odin gave them the spirit of life, Vili gave them sharp wits and feeling hearts. Ve gave the pair their senses of sight and hearing. Aesk was the name they gave the man, Embla the woman. They were given Midgard to live in, farm, raise stock and have offspring of their own. All kindred and kingdoms stem from them. One of the giants of Jotunheim, Narvi, had a daughter, Nagt. She was raven-haired and swarthy, as were the others of her kindred. Her first husband was Naglfari, their son Aud; her second husband was Annar and they had a daughter, Jord; the third husband was the bright Delling, kin to the sons of Bor, and their son was Dag. As with all his father's side Dag was bright-eyed, handsome and fair. 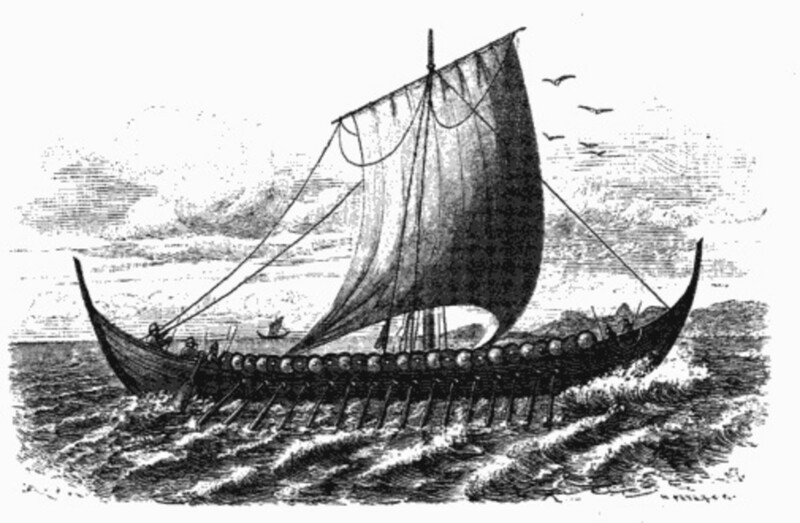 Odin took Nagt and her son Dag, put them in horse-drawn chariots and set them up into the sky to ride around the world each half-day. Nagt leads the way, her horse frosty-maned Hrimfaxi. Dag's horse is Skinfaxi, with a gleaming mane that lights the sky and earth beneath. Mundilfari lived in Midgard with two children who were so wondrous their father named them Soen and Maand. soen married a man, Glen. Odin, his brothers and their offspring were so angered by Mundilfari's daring they snatched both Soen and Maand and set them high into the heavens to guide the chariots of the sun and moon. Maand leads the way, guiding the moon along its path and sees fit to wax and wane as he will. 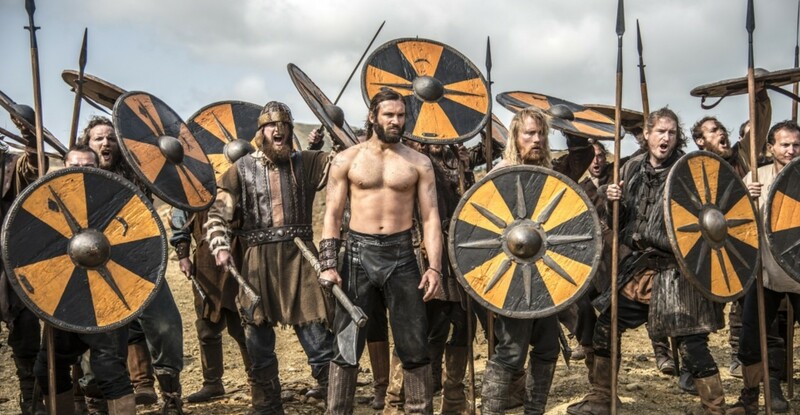 He does not travel alone, having plucked Bil and Hjuki from their father Vidfinn on Midgard. They had been carrying water from the well Byrgir with the water cask, Soeg, on its shaft Simul when Maand swooped and bore them away. 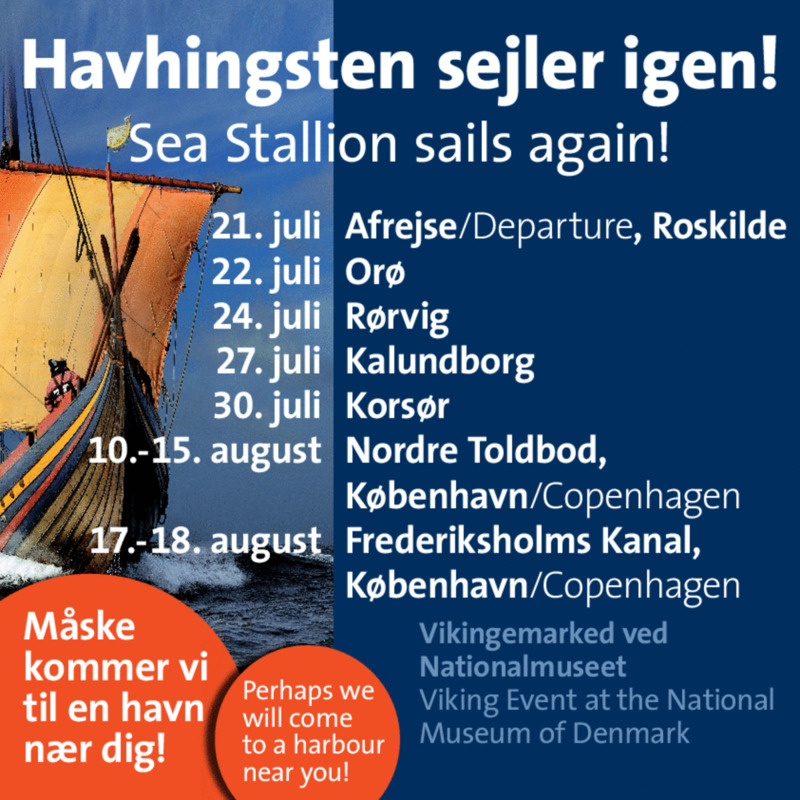 Soen follows him, with her steeds Aarvak - who rises early in the day - and Aalsvid, the strong one. The Aesir put bellows under the horses' shoulder-blades to keep them cool under the sun. Soen always hastens to stay ahead of the wolf, Skoll, who snaps and growls at her heels. The wold that races ahead of her is Hati, who chases Maand and one day both Soen and Maand will be run down by the wolves when their horses tire from hauling their chariots. The wolves are the sons of an aged ogress who lived in Jernskoven (the Iron Wood) to the east of Midgard. Once the sons of Bor had made the first man and woman, set Nagt and Dag, Maand and Soen into the heavens they recalled the maggots that writhed in Ymir's flesh and had crawled out over the earth. These creatures were given wits and the shapes of small men, yet they dwell under the hills and mountains in rocky grottoes and caves. 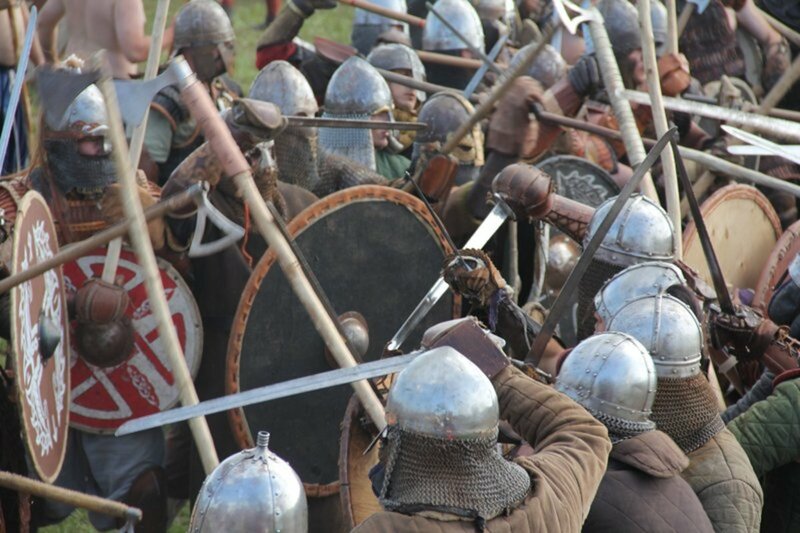 These men-maggots are known as the dwarves, under their leader Modsognir and his helper Durin. The earth was thus made with men, giants and dwarves, ringed by the great ocean and overshadowed by the cloudy sky. The sons of Bor then built their own kingdom of Asgard, a great stronghold, with a green plain and shining dwellings high above Midgard. 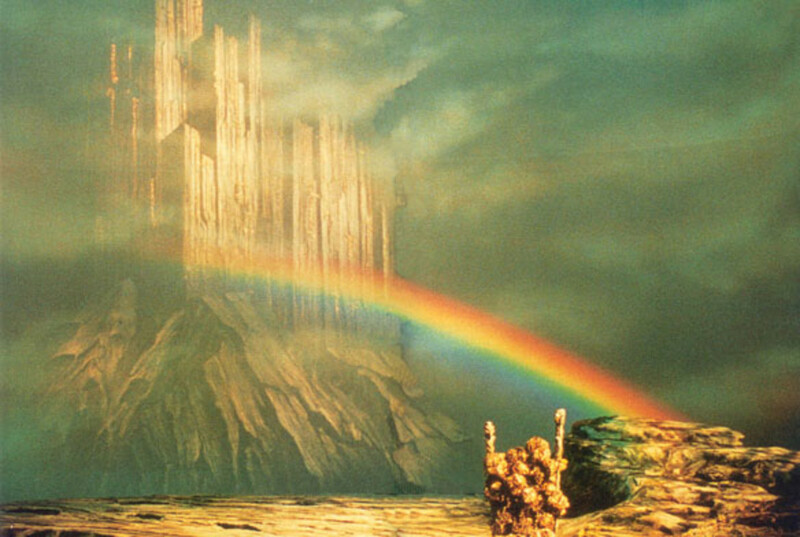 The two worlds, Asgard and Midgard, are linked by the bridge Bifroest, the brightly-coloured rainbow arch made of three colours with magic and great craft, strong as iron. The Aesir, guardians of mankind crossed Bifroest and settled into Asgard. 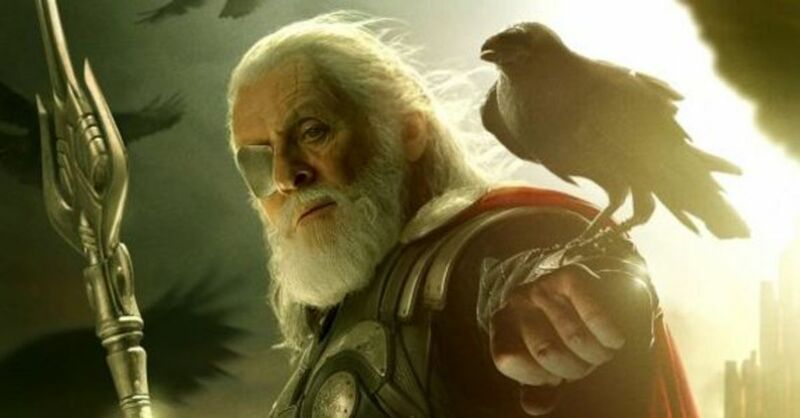 Odin the Allfather is the eldest and greatest. There are twelve lesser gods and twelve goddesses as well as a great gathering of the other Aesir. This was the onset of the world and what has gone before now - recalled or forgotten - in all the parts of the world. All that had gone before and all the parts of the world lie beneath the branches of Yggdrasil, the world ash tree, mightiest and stoutest of trees. 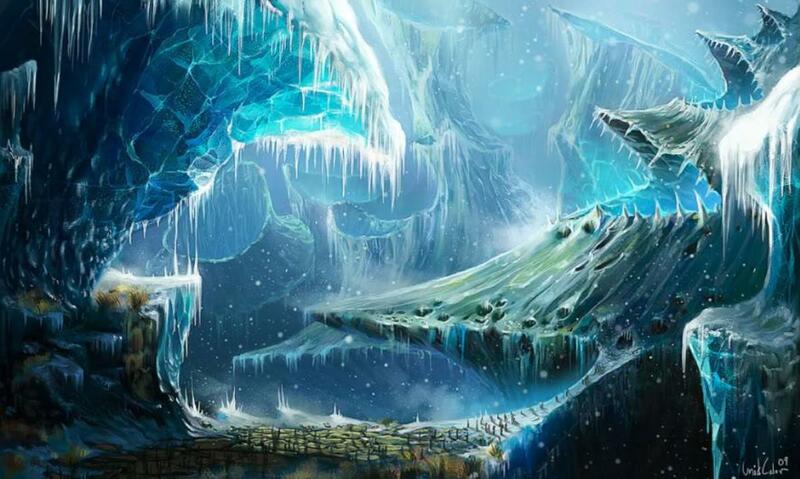 It overshadows all, its roots in Asgard and Jotunheim, as well as Niflheim, and a spring burbles under each. A hawk and an eagle sit on its branches. A squirrel, Ratatosk, scurries up and down the trunk; deer leap within its cradling branches and nibble at the shoots. A serpent swallows it and its is sprinkled nightly with the dew. 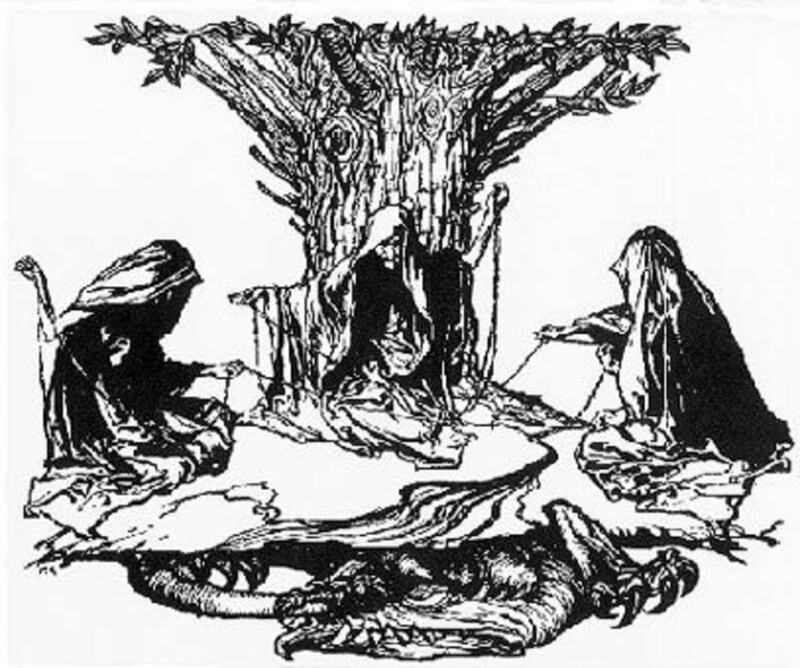 Yggdrasil lives within itself, gives life to the unborn, sighs and creaks with the winds that fan the worlds around. 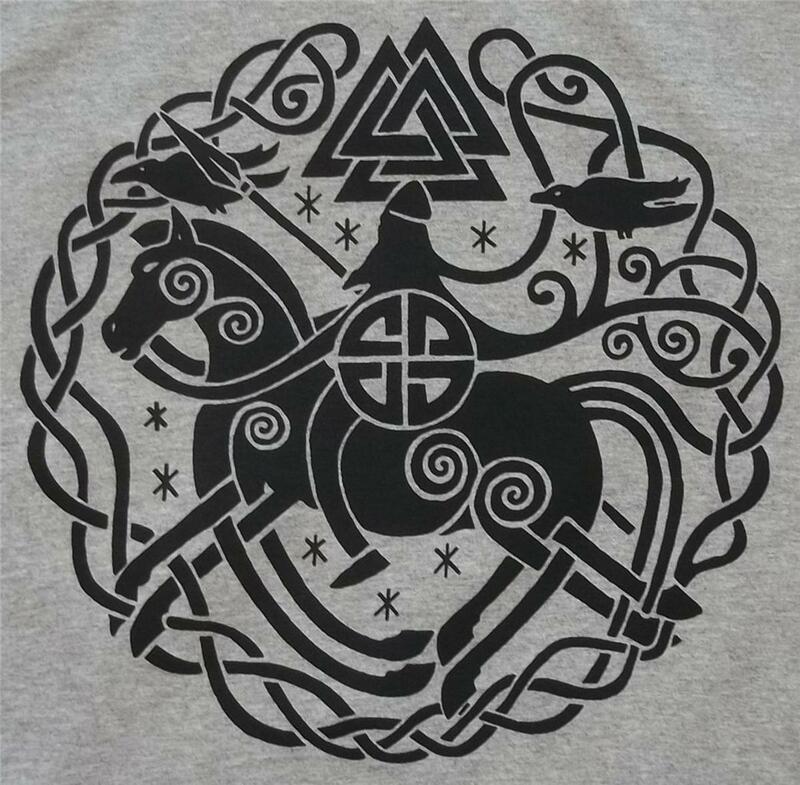 On the Internet there are a number of illustrations - paintings - of Odin on Sleipnir, this outine version is the simplest. As for the 'y-for-g', we do it all the time without knowing it. Editha, or Edith comes from Eadgytha. Aelfgifu became Alviva. Funnily, Eadgar didn't become Edyar but people began pronouncing the 'g'. North Germans say 'y' for 'g', as in 'yehabt' (had) for 'gehabt'. One of the characters in two of my RAVENFEAST books is Aethelthryth (see the Hub), the innkeeper's wife at the "Eel Trap" near London Bridge. You are right that German helps, but I'm sorry, I just have a very hard time reading "g" as "y"! Thank you for the pronunciation lesson. Offhand I can't remember anything in Tolkien, but I did read the names Ask and Embla in C. S. Lewis's writing, and I didn't know what man and woman had to do with ash and elm. So this is enlightening. And I also appreciate the picture of Sleipnir. I always wondered where the four other legs would go. Some of the names I've used would be more familiar if you knew Old English, and some just need a 'tweak' in reading, like 'Ratatosk' = rat-tooth ('tosk' as in 'tusk'); another guide is the silent 'g' in the middle/end of a word/name, thus 'Dag' sounds like 'Day' and the silent 'd' after 'n', so 'Maand' becomes 'moan'(or 'Moon' two a's together come out as 'o'); 'Soen'(short vowel sound) is 'Sun'; it helps to know a bit of Danish and/or German - and that's the link with Old English. Modern English has 'wandered away' a bit from its roots with the influx of French and Latin/Greek terms that confuse rather than enlighten. I’ve gone through your all postings, awesome piece of work. The words are catchy and speech is attractive. I really appreciate your efforts. Keep it up. Fascinating. So much going on with strange beings with unfamiliar names. I felt I was reading something like a cross between the bible and Tolkein. I didn't follow some of it, but that's part of the mystery of it-- the very foreign-ness of it is its essence. Obviously some names are familiar, like Odin, Asgard and Midgard. One I may have heard before is "Yggdrasil"-- I could have sworn that was in Clive Barker's Imagica. The very strangeness is compelling.